Have you ever had pumpernickel bread? I had not had pumpernickel bread until the day I had lunch with a friend and ordered a sandwich with smoked salmon on pumpernickel bread. Since that day, I am an avid pumpernickel bread lover. Why did I not try this bread all these years? I assumed that this bread would be dry, flavorless, and perhaps even bitter. Why? I absolutely love the flavor of pumpernickel bread. Here is how my mind processes pumpernickel bread – its earthy, savory, not too soft, slightly chewy, somewhat dry…. Well, I tried to describe it here. Try it for yourself (if you have not yet) and you will love it too. My friend lives / works in Chelsea and she suggested Cafe Champignon for lunch. I was game because I am always on the look out for new, fun restaurants / cafes to have lunch at. She told me that it’s on 7th Avenue between 21st and 22nd streets. Turns out there are two – one is Cafe Champignon (the one that we went to – i.e., the one that I am writing about), and one that is called Champignon Cafe. They probably belong to the same management, and so have the same menu. It seemed as though Champignon Cafe (the latter), is for take-out and delivery, and I may be wrong about this. Not that it matters, because the menu is almost the same in both outlets. The food served is the “finest infusion of American-French cuisine” per the Cafe’s / Bistro’s website. Cafe Champignon was a relatively small, cute, cozy cafe with excellent food and service. The Cafe has a bar area as well with a few beers on tap (not operational during lunch. I would go back to Cafe Champignon again, knowing that portion sizes are large. 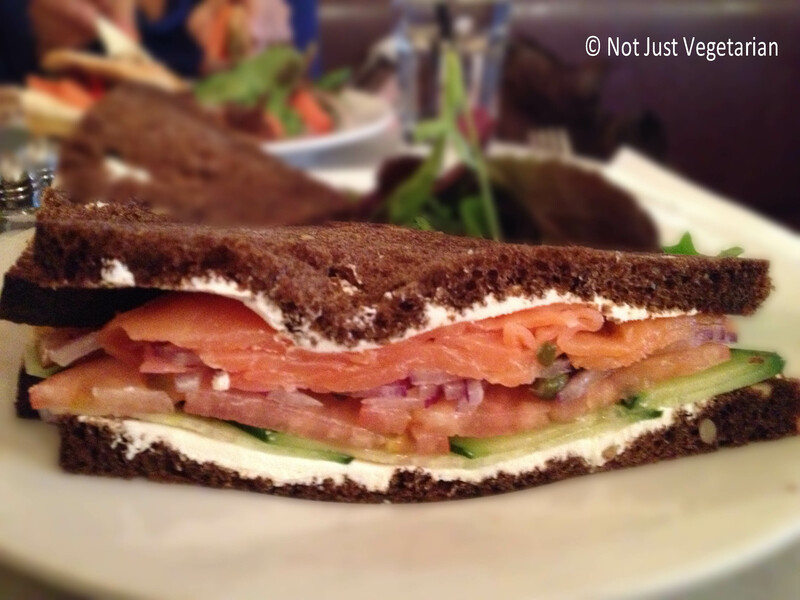 The smoked sandwich that I got on pumpernickel bread was the most delicious smoked salmon sandwich that I have ever had. There were several layers of perfectly smoked salmon. The cream cheese was not too cold, and was spread evenly on the slices. The thinly sliced cucumbers and onions were perfect inside maintaining their crunch. If there was one thing that I would have changed about this sandwich, it’s that I would have made it smaller. But then, I could have just had half if the portion size is large, right? What do you think I did? So, have I convinced you about trying pumpernickel bread? Cafe Champignon does have some vegetarian options among its appetizers and sandwiches.